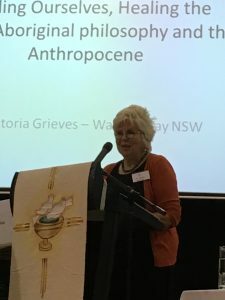 The Environment Meditatio held in Sydney 22-24 April was described as ‘transformative’ by some of the 350 people who attended. The first Meditatio on the Environment for the WCCM, it brought together significant speakers from the various disciplines of theology, philosophy, science and spirituality. It was both a sobering reminder of the ecological crisis we currently face and at the same time an inspiring call to action. On Saturday, the morning began with the powerful sound of the didgeridoo played by a Walbunga man from the south coast. This sound resonates deeply in the human body and psyche and suggests that ‘deep calling on deep’ that Miriam Rose Ungunmerr speaks of in her talk of ‘Dadirri’ (contemplation). Later in the morning, we were reminded by Aboriginal philosopher Vicki Grieves of the ‘gift’ of aboriginal people and culture to the white people of our land. The ‘pattern thinking’ of these people, as seen in much of their art, offers to us a consciousness of the connections of all life and a view of the land as sacred. Susan Murphy spoke of the need for something to be ‘roused’ in us such that we would act towards the other with compassion. She reflected on the human tendency to quickly move away from that which makes us feel uncomfortable. The practice of meditation is, of course, a practice of staying with and attending to the present moment. A visual ‘lectio’ later in the morning confronted us with images of profound human wounding of the other than human environment. We were invited to stay present to those images and notice our own responses. Later we used some words from Laudate Si for further lectio. A robust dialogue in the Q&A session during the afternoon prompted a deeper reflection on the role of the church in shaping past and present attitudes to the environment. Various speakers proposed a common view of the culpability of Christianity in the social, political and technological worldview of western civilization that contributes to the disregard and ‘de-sacralization’ of nature. David Tacey spoke of the necessity of facing this ‘shadow’ in Christianity. We were reminded however that human beings are a part of nature rather than being apart from it. The contemplative consciousness that meditation fosters sees this non-dual reality. And further conversation recognised that human destructiveness is not located solely within any one sector of society but is a universal. On Sunday, the event hosted a rich feast of workshops for participants to attend. In the afternoon a panel facilitated by Donna Mulhearn that included some young activists was engaging and inspiring. At the heart of the conference lay the practice of meditation. Led by Fr Laurence we embodied the practice of stillness and silence. Ultimately this Meditatio confirmed and clarified the role of meditation in contributing to the healing of earth-human relations through a new consciousness. Meditation fosters a contemplative consciousness for the common good of the whole earth community. As a practice that bears the fruit of simplicity it may reveal to us both the need of, and our capacity to live within, limits such that we will secure space for other life and future generations. As a practice that heals our vision, that is to say, our dualism, it may restore a world-view of life as a web of relatedness whereby we recognize that when we harm a part we harm the whole. As a practice that returns us to our own centre so, as John Main says, we discover that we are connected with every centre, the centre that is everywhere. In this way, we learn to live in harmony with the whole of creation.